Have a night out at the Jazz Club, listening to the soothing vocals of the Lady In Red while you spin in copious amounts of cash. Click here to play! You won’t be able to take your eyes off the Lady in Red once she takes the stage at this smoky vintage jazz club, as she is the main symbol in this game. Spin two to five of her across the reels to bring in a top payout worth up to 2,500 times your line bet. Her backing band is red hot tonight as two to five of these talented musicians across an active payline will bring in up to 500 times your line bet. There are also red roses and glasses filled with the smoothest whiskey you’ve ever tasted. Both of these symbols will payout a max of 300 times your line bet. Keep an eye out for the paparazzi as these annoying camera snappers are flocking around the club for a shot of the Lady. Catch two or more across the board and you’ll multiply your total bet. Three or more will award up to 25 free spins in which all wins are tripled. 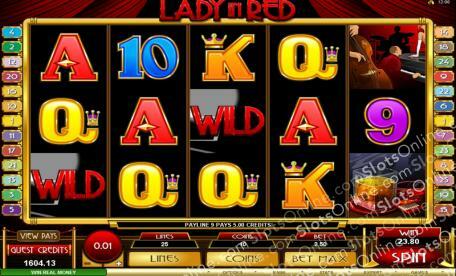 So, have a relaxing night of music, whiskey, and plenty of cash with the Lady in Red. The nosy paparazzi are scatter symbols. Two or more anywhere on the board will payout up to 200 times your total bet. Three or more will trigger up to 25 free spins. The Lady In Red logo is a wild. It will replace all other symbols, excluding scatters, to help you bring in more wins. It will also payout a maximum of 125,000 coins and double payouts when it appears in a winning combination.